What a week for life sciences news, and it’s not even over. Perhaps we’ll get a slight break as the healthcare and biopharma worlds get on airplanes and descend upon San Francisco starting in 3…2…1…. Two requests from this veteran attendee: Leave your colds and flu at home, and wear bright colors if the weather’s nice. 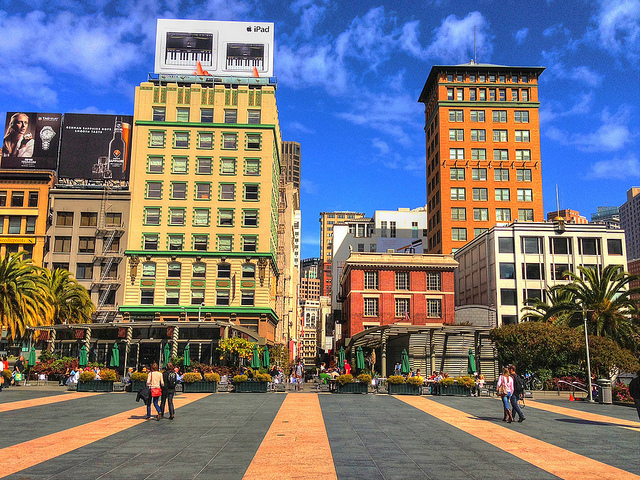 We don’t want Union Square to look yet again like beach full of elephant seals, as this wry observer noted last year. The Gilead/CVS news was a response to rival AbbVie’s tie-up just before Christmas with Express Scripts (NYSE: ESRX), the largest drug-buying middleman in the U.S. For more on the nuances and potential outcomes in the hepatitis C market, read the op-ed piece biotech investor Peter Kolchinsky wrote recently for Xconomy. For the rest of the week’s West Coast news (so far!) let’s dive into the roundup. —Three Bay Area biotechs together got nearly $120 million in venture commitments this week. Details about funding for Aduro BioTech, Global Blood Therapeutics, and CytomX Therapeutics are in a separate venture roundup. Global Blood also said Thursday it has named former San Francisco Mayor Willie Brown to its board of directors. —Genetic information provider 23andMe of Mountain View, CA, inked a deal with Roche’s Genentech division, of South San Francisco, CA, to provide whole-genome sequencing data from 3,000 Parkinson’s disease patients. Genentech will use the data for drug R&D, and pay 23andMe up to $60 million, according to media reports. It’s the second collaboration between the two parties. —Carlsbad, CA-based Isis Pharmaceuticals (NASDAQ: ISIS) said Johnson & Johnson’s Janssen Biotech (NYSE: JNJ) is paying $35 million upfront and another potential $800 million to use Isis technology to discover and develop new drugs targeting autoimmune diseases of the gastrointestinal tract. —Amgen (NASDAQ: AMGN) of Thousand Oaks, CA, is paying Kite Pharma (NASDAQ: KITE) $60 million initially to collaborate on chimeric antigen receptor T cell (CART) therapies for cancer. Kite will provide the T cell technology; Amgen, the cancer targets. Kite could earn up to $525 million for each successful treatment the companies bring to market. —Gilead is also buying a liver disease drug program from German firm Phenex Pharmaceuticals and eventually could pay as much as $470 million. The work has not yet reached the clinic, but its main target is likely to be non-alcoholic steatohepatitis, a fatty liver condition that can lead to scarring, cirrhosis, and liver failure. —In the waning days of 2014, three San Diego life sciences companies filed for initial public offerings, all aiming for proceeds of less than $70 million. AltheaDx wants up to $69 million for its personalized diagnostic business; Tracon Pharmaceuticals is eyeing as much as $57.5 million to advance its cancer drug candidates; and BeneChill is looking for up to $14.6 million for a portable device to prevent lasting brain damage in heart attack patients. —San Diego’s Neurocrine Biosciences (NASDAQ: NBIX) saw shares jump 19 percent Thursday upon news that licensing partner AbbVie (NYSE: ABBV) reported positive Phase 3 data for their drug elagolix, a treatment for a painful disorder of the uterus called endometriosis.